If you haven’t played any of DraftKings’ Millionaire Makers for the golf major tournaments you’ve missed out on some of the best payouts in fantasy for a $20 entry. The good news is that there’s still one more major left and that means one last chance to get in on the golf Millionaire Maker action. The final Millionaire Maker for golf majors is for the PGA Championship and takes place next week, Thursday, August 13th through Sunday, August 16th. If you haven’t played DFS golf yet, you select players for your team. Scoring is based on per-hole performance (birdie, par, etc.) and where your players finish in the tournament, along with a couple of other bonuses for things such as getting a hole-in-one or having a bogey-free round. 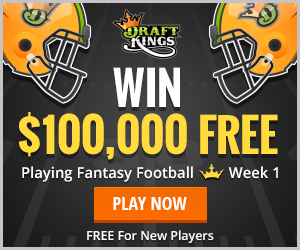 It’s also similar to many NFL daily fantasy contests in that it takes place over a number of days and isn’t strictly a one day tournament. In the case of golf, all DraftKings tournaments mirror the full real tournament and take place over 4 days. In our experience, it seems there is less written about golf DFS and less strategy available freely online which has lead to some of the easiest cashes we’ve had in any DFS events this year. This should continue to be the case as many of DraftKings current commercials are heavily advertising their golf tournaments. Take advantage of that and enter the $20 PGA Championship Millionaire Maker taking place on Thursday, August 13th.